Rhubarb is a vegetable that many people consider a fruit. This perennial vegetable comes back every spring to fill a growing area with large green leaves supported by long reddish-green stalks. The leaves are toxic in large amounts and people should not consume rhubarb leaves. Harvest the rhubarb stalks when they are long and sturdy and the leaves are broad and large. Always leave several stalks in the soil to provide the plant with nutrients for future growing seasons. Choose a growing area in a place that receives full sun. Pull any weeds on the surface of the soil. Dig large holes for each rhubarb root that are four feet apart from the center point of the holes. Make each hole approximately 12 inches deep and 15 inches in diameter. As you remove the garden soil, place the it into the wheelbarrow and combine it with equal parts of sand and compost. Mix the three materials so that they are completely incorporated. Place the rhubarb roots into the prepared holes so that the buds will be approximately 2 inches below the soil surface. Fill in the holes around the rhubarb roots with the soil mixture and pat the soil down firmly around the roots. Water the newly planted roots generously. Lay down a 2-inch layer of compost over the top of the soil to add nutrients to the soil and help to keep the soil moist. Watch for seed stalks and remove them as they appear to help the plants channel energy to the roots. Leave the rhubarb to grow and do not harvest any rhubarb the first spring after planting. Assess the rhubarb the following spring. If the rhubarb is growing abundantly, remove a few stalks for harvest. 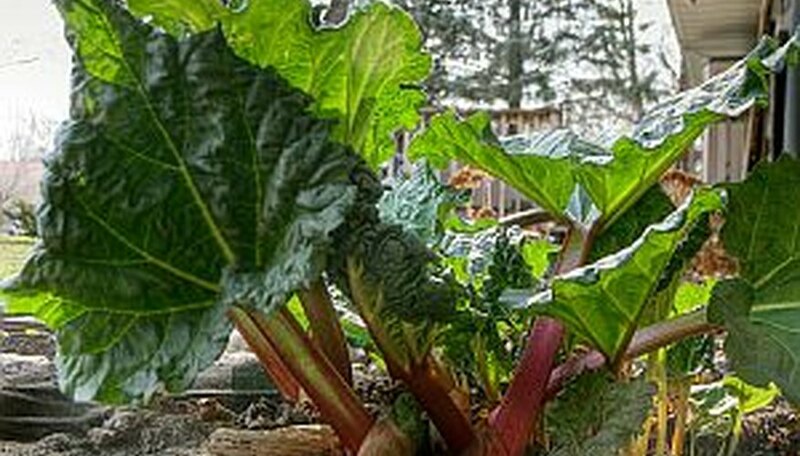 Fertilize rhubarb during the second growing season. Side dress the rhubarb plants with the fertilizer as the first plant stalks appear in the spring. Sprinkle approximately 1/2-lb. of fertilizer around each plant and work the fertilizer into the soil. Repeat the fertilizing process again in the autumn before the ground freezes. Harvest the rhubarb the third spring by pulling the stalks gently away from the crowns. Leave several stalks on the plants so that the plant can rejuvenate for the next growing season. Cut the leaves from the stalks immediately and discard them. Divide the rhubarb plants every four years before the growing season begins or after the growing season ends. Dig up the roots and divide them so that each new part has one bud and crown. Plant the newly divided rhubarb roots and crowns back into the soil.